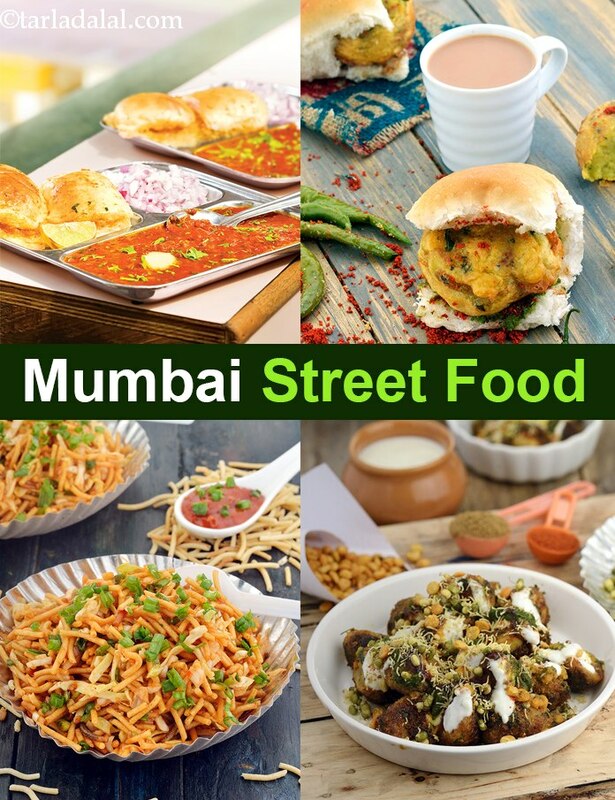 Popular Mumbai Street Food recipes, Mumbai roadside recipes. I’m quite passionate about eating out… and this means everything from sophisticated food from high-end restaurants to greasy, spicy street-food. Street food is extremely popular in Mumbai, mainly because you can have a wholesome meal at half the price of any comparable dish in a restaurant. Be it breakfast, snacks or even junk food, these can be purchased on any foot path, beach-side or road corner. Khaugallis are an integral part of Mumbai. For the uninitiated, in Marathi, khau means treat and galli means a small lane. They have a large variation of every dish, each prepared more temptingly than the other. Those who have not tasted this, fussing about hygiene and nutritive value, have really missed something good in life. The Khaugallis at Ghatkopar, Zaveri Bazar, SNDT- cross maidan and Mohammad ali road are few popular places to indulge into street food that is freshly prepared right in front of your eyes with enticing aromas. In fact, some of the vendors gain such a reputation for their snacks that people will journey far to experience the food from a specific vendor. Whether it is a good old lazy Sunday, a festive season or simply a normal working day, the street side is always packed with hungry people waiting for more. Smartly-dressed guys in ties and formals will be relishing pani puri, right next to a rikshah-wala enjoying the dish with equal gusto! Rich and poor of all ages forget their differences and enjoy the feast, not bothering overly about sophistication, ambience and other niceties. It is not surprising that anything innovatively presented or made in a jiffy at a moderate price and proportion works well in Mumbai. Be it aloo parathas, zunka bhakar, bhurji pav, chila or even a mobile tea-coffee wala who caters to our needs on a cycle, they all have something to offer! Like most things, street food in Mumbai has also undergone changes. For ages, it was ruled by the vada pav and dosas, along with the standard cutting chai, bhel and bun maska, bhel accommodated variations such as Chinese bhel and corn bhel. New wonders like Frankies, khichai papad and grilled sandwiches found a place on the streets of Mumbai. Just like the city that expands to accommodate anybody who comes to it with hope, the city’s street food scene has also adapted, imbibing the best of several cuisines from Western to Oriental! Mumbai street food breakfast. Anna selling a plate of soft, fluffy idli or crispy medu vada drowning in a pool of coconut chutney and tangy sambhar is a common sight in various nook and corners of office areas in Mumbai. Also, you will find vendors selling Batata Poha, Sheera, Upma, Sabudana khichdi in the morning near station roads. It is consumed by most office-going Mumbaikars as breakfast. Mumbai street food dosas. Ever-green favorites like sada dosa, mysore masala dosa and cheese dosa are savored by everyone all the time. But with time and changing tastes, not only do we now see a wide range of new foods, but also revamped versions of the all-time favourites. Dosa gave birth to Chopsuey dosa, Spring dosa. Also, some dosa got upgraded with an addition of popular subzi like palak paneer, paneer bhurji to make palak paneer dosa, paneer bhurji dosa or there is even paneer chilly and kolhapuri dosa. One of my favorite is the cheese burst dosa oozing with cheese and loaded with vegetables. Some foods like golas, pani puri etc are best had at the roadside, for the sheer fun! The kind of happiness and joy one has eating these finger-licking delicacies at the stall cannot be compared to eating at home. However, for those who wish to reproduce the magic of the street-side vendor in their own kitchen, this collection of Mumbai roadside recipes serves as a guiding light, presenting the basic technique of making each dish, apart from capturing the intricacies of each street food and taking you for a walk along the Mumbai roads, showing you the foodie’s favourite spots and even the price range of each food!